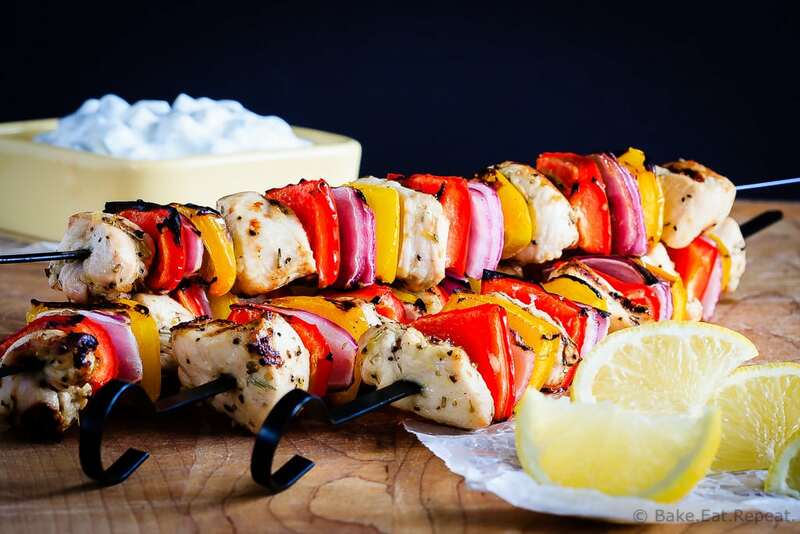 Greek Chicken Kabobs with Tzatziki Sauce - Bake.Eat.Repeat. An easy, 30 minute meal for the summer, these grilled Greek chicken kabobs with tzatziki sauce are fantastic. The whole family will love them! I’m a little bit addicted to Greek flavours. Tzatziki sauce in particular. I can’t get enough of it. When I make meals like these Greek chicken kabobs, I always make extra tzatziki sauce just so I can use it on everything for the next week. On sandwiches, as a dip for veggies, it’s fantastic – and it’s so easy to make. 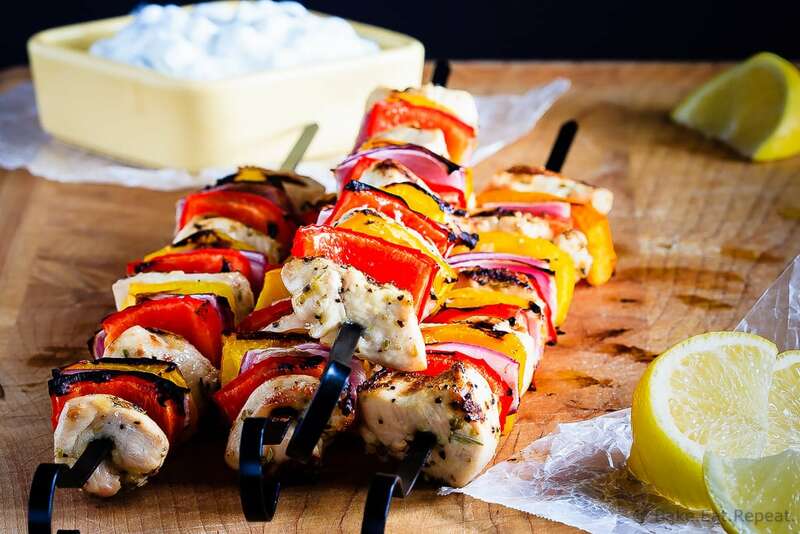 Which makes these Greek chicken kabobs with tzatziki sauce the perfect meal for 30 Minute Thursday this month. I’ve made about 6 different variations of this meal over the last few months. I made it in the oven, on the grill, with chicken thighs, with pork tenderloin, pork chops, and on and on. They were all delicious, but I wanted it to easily be a 30 minute meal. Not just a 30 minute meal if you’re doing 16 things at once to get the meat cooking immediately. So I finally settled on Greek chicken kabobs. And I’m super happy about that because they were the best of all the variations I tried. Although my family might just be a little sick of this by now. Maybe. I should probably make them something different tonight. But it’s gonna have to be something quick because these summer days are slipping by way too quickly for my liking. I’m having a hard time wanting to be in the kitchen (or in front of the computer!) this last month. It just seems like a much better idea to be at the park with my kids then working on something inside! Pretty sure that’s going to continue for the rest of the summer. It disappears too fast to not spend as much time as possible outside with the kids. If you’re feeling the same way, check out the links below, or look at past 30 Minute Thursday posts and you can find a whole bunch of 30 minute meals to keep you out of the kitchen and enjoying the sunshine! 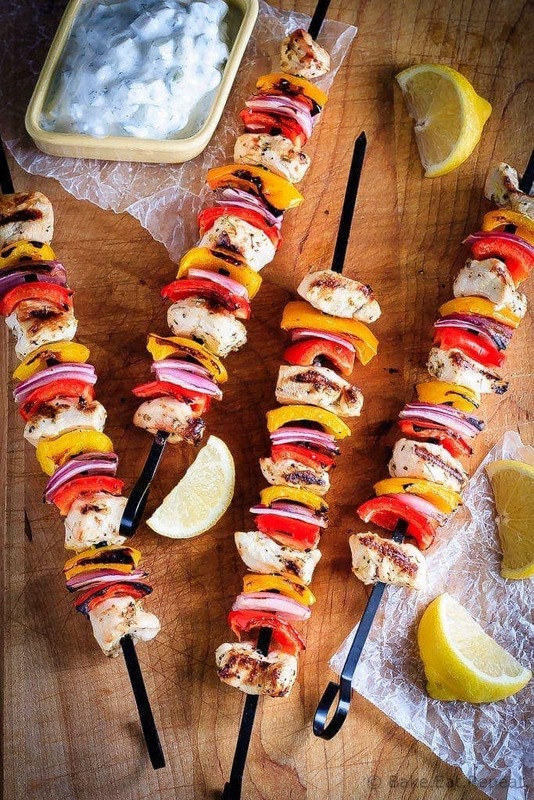 But start with these Greek chicken kabobs. Because tzatziki! Preheat the BBQ to medium heat. In a medium bowl, whisk together the olive oil, lemon juice, lemon zest, salt, pepper, rosemary, oregano and garlic. Add the chicken cubes and toss until it is completely coated. Thread the chicken, peppers and onion chunks onto skewers, alternating as you go. Grill the kabobs for 10-15 minutes, turning once, or until the chicken is cooked through. Meanwhile, in a small bowl, stir together the yogurt, cucumber, garlic and dill for the tzatziki sauce. Refrigerate until ready to eat. I am so on board with this because I'm a huge tzatziki addict! These look delicious, and like the perfect easy summer dinner! I absolutely ADORE Greek food - I could eat it pretty much every day of the week, so these kabobs with tzatziki are calling to me! I'm right there with you with the extra tzatziki - it goes on EVERYTHING! I feel the same way about the summer slipping away, Stacey! It's much better to be enjoying these days than working! We're on the same wavelength with the Greek flavors today. These kabobs look delicious! Ahhh....we're actually having a Greek food festival here this week and it's been awesome. I want all the Greek foods and flavors! These kebabs sounds fantastic and I love all the veggies! I love Greek flavors too, although I don't cook with them often enough! 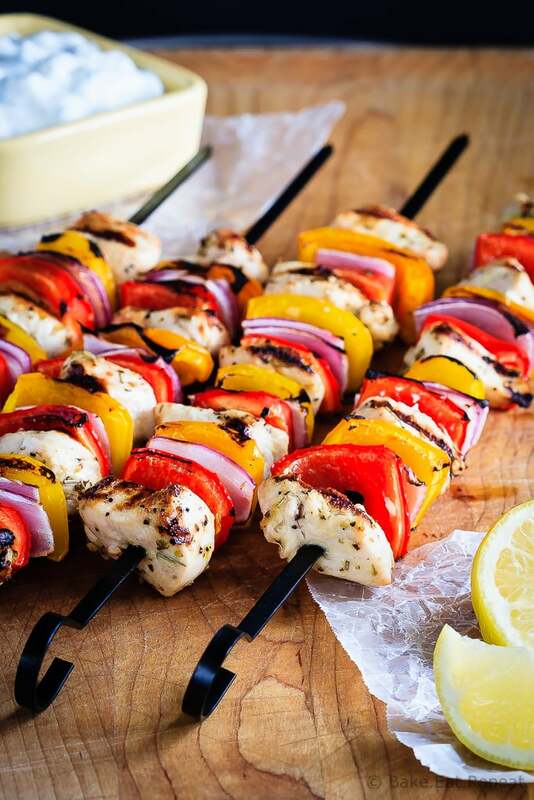 These kabobs look fantastic, Stacey! Especially with that tzatziki...so perfect for the summer!